When proceeding through an intersection, not only do you need to pay attention to oncoming traffic to make sure it is safe to proceed, you also need to be sure there is enough room across the intersection for you to go forward without obstructing the intersection. So, even when you have a green light, be sure there is enough room on the other side, so you don’t block the intersection. It is an all too common sight during rush hour traffic in downtown Spokane to see someone proceed through a green light, only to be stuck in backed up traffic in the middle of an intersection. Not only does this delay the oncoming traffic, but it can be a major hazard for pedestrians. In addition, it is a risk of a car accident to other backed up traffic, and oncoming traffic. 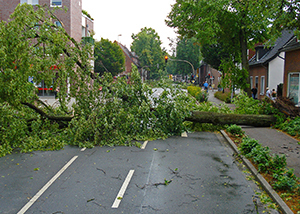 If there is an obstruction caused by a collision, debris on the road, or other object, be sure to report it to the proper authorities to have the hazard removed. RCW 46.61.202: Stopping when traffic obstructed. No driver shall enter an intersection or a marked crosswalk or drive onto any railroad grade crossing unless there is sufficient space on the other side of the intersection, crosswalk, or railroad grade crossing to accommodate the vehicle he or she is operating without obstructing the passage of other vehicles, pedestrians, or railroad trains notwithstanding any traffic control signal indications to proceed. An accident attorney in Spokane can help you a great deal with your car accident case. The experienced and knowledgeable attorneys at Parke Gordon Law Firm have helped hundreds of car accident clients receive the compensation they deserved from their car accident. Call the Spokane law office of Harvard law grad Mat Parke for a free consultation. We can usually tell you over the phone if you have a good case. Call (509) 482-7274 today to get started on your case.